Argolis is a historic area, hosting the unique treasures of Myceanean civilization (the palace of Mycenae, the acropolis of Tiryns, Asini), the impresive theater of Epidavros, the imposing castles of Palamidi, Larissa (of Argos), Akronafplia. It is also a very attractive corner of Peloponnese, with many sandy beaches, hotels of all categories, taverns and restaurants serving high quality cuisine, and beautiful cities and villages like Nafplion, Porto Heli and Ermioni. 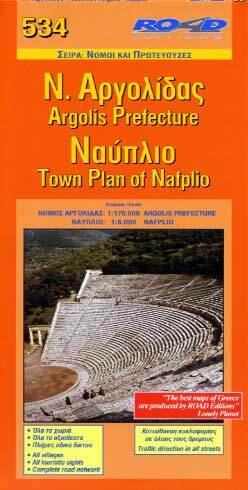 This map presents the complete road network of Argolis, as well as a very detailed town plan of Nafplion, noting all hotels, restaurants, bars, and many more.